The hip flask is fitted with a hinged bayonet cover encircled with a band of applied ribbed decoration. 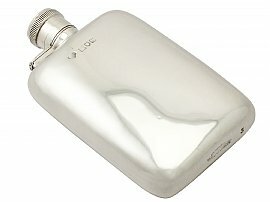 The underside of the flask bears the retailer's mark 'Goldsmiths & Silversmiths Company, 112 Regent Street, W'. Full hallmarks struck to the anterior surface of the flask and part hallmarks to the interior surface of the hinge and posterior surface are all clear in keeping with age and location.